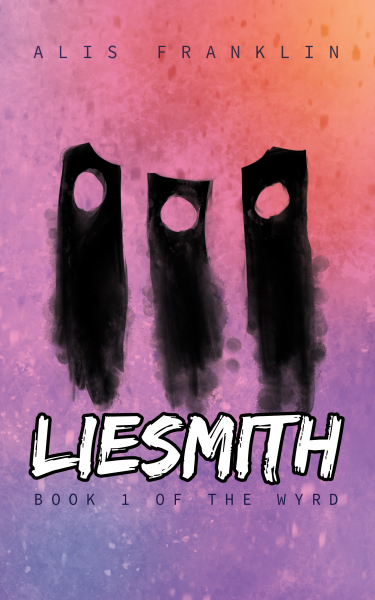 Also, in light of this discussion, I’ve added a page that describes more clearly how my blog’s Tumblr and Dreamwidth mirrors work. I like this round-up of Tumblr-to-Dreamwidth migration guides (for those times when Mastodon’s 500 characters just aren’t enough). 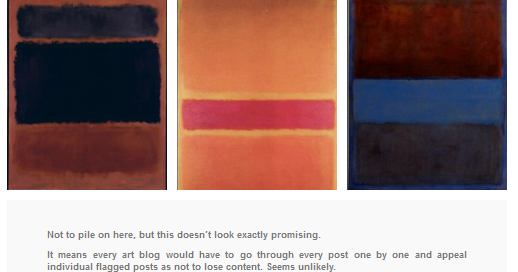 Oh no not even Rothko is safe! So to any fandom people looking for a new home in the post-Tumblr world, I’ve set up fandom.ink as a fandom-friendly and fan-run Mastodon instance. no ads, tracking, or user monetization. For those unclear on Mastodon, it’s a Twitter-like social network, a primer on which may be found here. Any other questions, feel free to ping me. Otherwise, um… enjoy? What is up with all the AO3 concern trolling on Tumblr recently? So what do Russian spies reblog on Tumblr? As part of our commitment to transparency, we want you to know that we uncovered and terminated 84 accounts linked to Internet Research Agency or IRA (a group closely tied to the the Russian government) posing as members of the Tumblr community. The IRA engages in electronic disinformation and propaganda campaigns around the world using phony social media accounts. When we uncovered these accounts, we notified law enforcement, terminated the accounts, and deleted their original posts. Here, capped for posterity, is what I found. 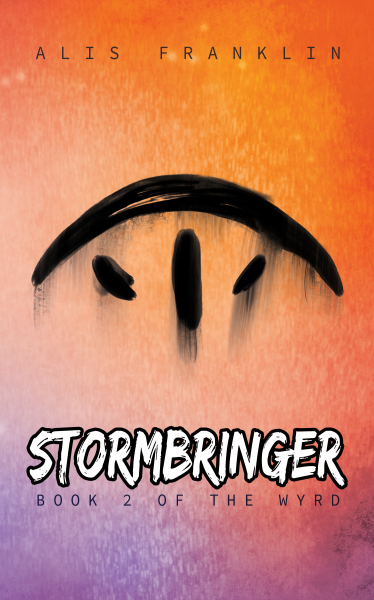 There are quite a lot of images here, so I’ve categorized them into their broad content areas. Note that in a handful of instances, I’ve also capped the Google result, when I felt the post text was interesting in itself and where I couldn’t easily find a reblog. In these instances, it’s the bolded Tumblr name that’s the bot, not necessarily the URL. What’s this? An updated Tumblr layout? Gasp! … Man, coding layouts by hand. How oldskool. 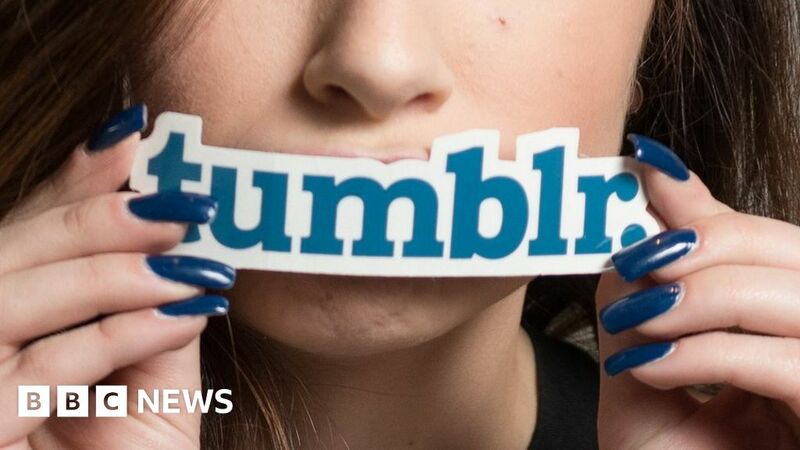 What will stop Tumblr's tumble? Three years have passed since Yahoo bought micro-blogging site Tumblr, but it is not the goldmine it once hoped. … Yuh. Uh-huh. Tumblr’s problems are because you can’t cram enough ads onto the platform. Yahoo paid $1.1bn (£830m) for the company back in 2013 – but it has since slashed $712m (£541m) off its valuation. Sites such as Buzzfeed tackle the dislike of intrusive advertising with “sponsored posts” – editorial content such as photos or videos with an advertorial slant. Ms Marouli thinks such a focus on “premium” content could help Tumblr in the future. And back to ads again. So, like hey. Here’s a revolutionary idea. How about working out a business model that doesn’t revolve around selling advertising. Anyone? anyone? No? Okay. Tumblr could soon find itself in new hands, because Yahoo is selling its core internet business. US telecoms giant Verizon is said to be interested. Other rumoured buyers include […] the UK’s Daily Mail. I’m seeing that Elan Gale airplane fight Tweet stream going around on my dash again, so this is your periodic reminder that Gale is a TV producer and the “fight” was both a hoax, a marketing stunt, and grossly misogynist. So… yeah. Let’s not, hey. Installing the Pokémon xkit extension just makes me depressed over how many Pokémon I don’t know.